Sample pages from an Invisible Ink book show the invisible ink pen in action! 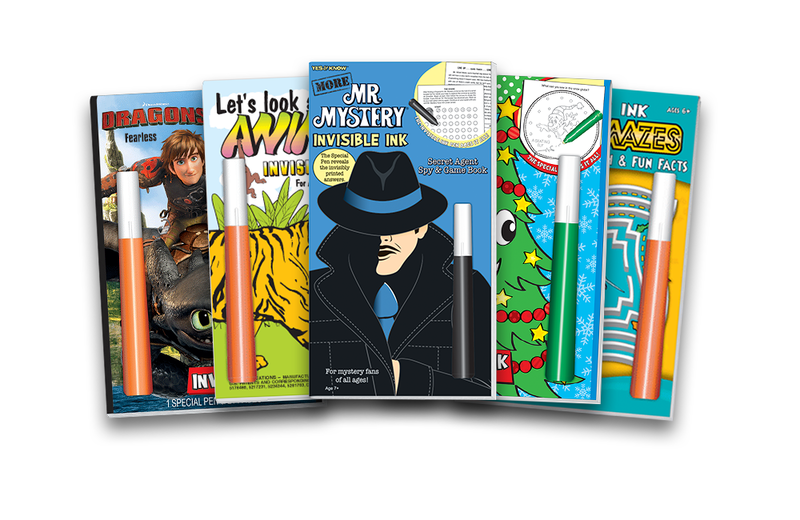 To the relief of parents everywhere, Invisible Ink game and quiz books from Lee Publications have provided road-trip entertainment for children for over 40 years. There are now more than 200 titles, with many featuring beloved characters from Disney movies & television shows. Despite the passage of time, the books have remained true to their 1970s roots, with many retaining a decidedly retro look to this day. Each book includes one or two invisible ink pens and roughly 48 pages – more than enough content to “provide hours of by-yourself entertainment” between pit stops. 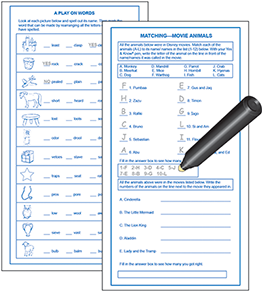 The books come in various sizes and offer quiz questions with invisible answers on a variety of topics, including history, sports, animals, and outer space. My personal favorites were the Mr. Mystery books, which allowed me to assume the role of amateur detective and use the invisible pen to solve mysteries by decoding secret codes, extracting clues to solve crimes, and thwarting thieves attempting to break out of jail. Invisible Ink books also offer their own take on retro-gaming, with decidedly no-tech versions of various sports games and classic puzzles, like Hangman, Tic-Tac-Toe, Black Jack, and Fleet, a Battleship knock-off. With over one million units being sold every year since 2012, the Magic 8-Ball is fairly ubiquitous and continues to be a popular resource for instant "answers" to life's pressing questions. Before the proliferation of handheld electronics and computer-based video games, there were the Tru-Action sports simulation tabletop games – powered by a rudimentary engineering concept: vibration.